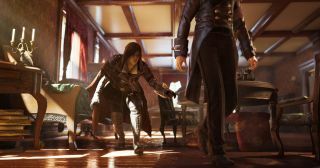 Assassin's Creed Syndicate's Evie can turn "virtually invisible"
If you've wondered how Assassin's Creed Syndicate's two protagonists will play differently, this ten-minute walkthrough video is a useful introduction. It follows Evie on what Ubisoft is calling a "black box" mission, i.e. one in which you choose your own path to your assassination target. Each black box mission starts on a vantage point from which Evie spies various ways she might reach her victim. Here, there's an "infiltration opportunity", a "stealth opportunity", and an "assistance opportunity". Hopefully these are varied enough between different missions to be interesting. This video gives quick examples of two possible paths and then focuses on one that supposedly best suits Evie's abilities. Evie has her own skill tree and abilities, and this video covers some of them, including a contentious "chameleon" ability that's unique to Evie. It renders her "virtually invisible to the enemy, even on open ground". The Assassin's Creed series has always featured far-fetched gadgets and abilities, but this one does seem particularly out there. What do you think?